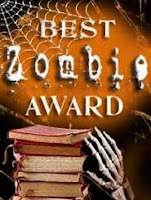 Bookbinding Etsy Street Team: Re:Paper wins BEST Zombie Award! Congratulations to Sara, RePaper.Etsy.com! After a week of active voting, Sugar Skull earned the most votes and is hereby officially awarded the 2008 BEST Zombie Award! Sara wins all associated bragging rights, to be used at her discretion, for a full year. She can also make liberal use of the BEST Zombie Award graphics. And finally, here is a closer look at her and the winning book! The winning book bears a skull inspired by Day of the Dead sugar skulls, with clever matching vibrant candy wrappers sewn into the binding. 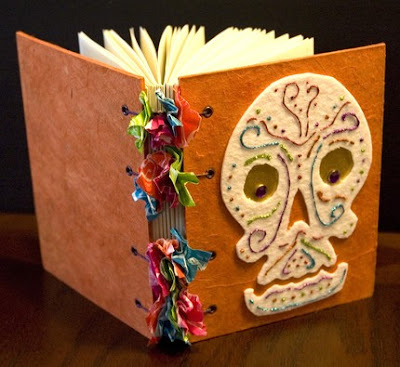 Sara titled this book, "Momento Moir, Sugar Skull Blank Book" and wrote "Eat candy and be merry. For tomorrow we die. Ah Halloween... the innocence of candy and playing dress-up, the darkness of nasty pranks and reminders of our mortality." Such a succinct and thoughtful summary of the Halloween traditions, and wonderfully represented here in book form! Sara calls herself a hackbooker. She says "Hackbooking," her own bit of jargon, is the craft of guerilla bookbinding. Using found objects and fine papers, to create unique mixed-media books, albums, and folding frames. She is also a photographer and sometimes incorporates her photography in her books as well. Thank you Sara, for making such a terrific book for our Halloween challenge. Happy Halloween and happy bookmaking to all! Yay! Congrats! By the way, I love the book. I'm the one who bought it (and I was even in the contest). I've been filling it with stuff from a day of the dead party my husband and I hosted a few years ago. I've cut out sculls on some of the pages. It's super cool. Thanks! Wow! Thanks so much everyone! There is such amazing skill and imagination in this group, it's really an honor to have won. Thanks most of all to Kjersten for bringing the book into her home and giving it purpose. This is by far the best Halloween treat I got this year!